Road network: Orissa Roads1; Orissa Roads2; India's NH network; India's golden quadrilateral; the part of the GQ/NH-5 that runs through Orissa. 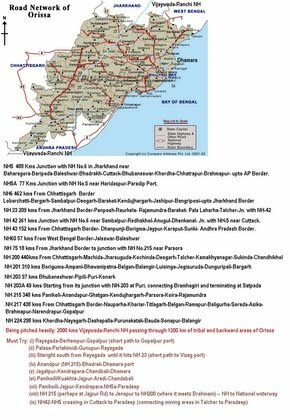 Future plans for Orissa: [1:april-28-05]; [2:april-28-05]. Connect NH 215 (perhaps at Jajpur Rd) to Jenapur to NH200 (where it meets Brahmani) with a highway as Jenapur is the location where the National waterway will cross the railway line and Jenapur is 7 kms from where a branch of the line goes to Daitari and Bansapani.